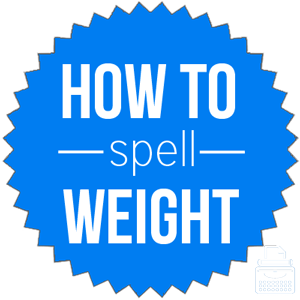 Spelling of Weight: Weight is spelled w-e-i-g-h-t. Definition of Weight: Weight is the measure of the heaviness of an object or person; a heavy object used in sports to throw, put, or lift; something heavy to hold down or counterbalance other things; a burden or pressure; and, the importance, influence, or authority of someone or something. The word weight also refers to making heavy or heavier, and, to cause to feel concerned or burdened. Pronunciation of Weight: Weight is pronounced wait. Weight rhymes with the words bait, trait, and hate. What does weight mean? The word weight can function as a noun or a verb. As a noun, weight refers to the heaviness of something or someone. The weight of the bowling ball was too heavy for me to lift, let alone use. At her checkup, the doctor informed her that she is not at her healthiest weight for her height and age. Weight also refers to a heavy object used in athletic events and exercises. Jane does not do cardio, but she does lift weights in the free weights section of the gym. I was shocked that such a small woman could throw a shotput ball of that weight such a distance. Weight, generally, refers to anything that is heavy and can hold down or counterbalance another object. He was disappointed with his rather useless gift: a whale-shaped paper weight. We will need to add some weight to the back of the truck for this winter weather. Sometimes, the word weight is used figuratively to refer to a burden or serious concern that causes people to think or worry. The weight of their lie weighed heavy on her and she wasn’t sure how long she could keep it in. It was like a huge weight was removed from her shoulders when she received the message from her father that he was alright. Finally, weight is used to refer to one’s influence or power. For some reason, his father’s approval carried great weight. Due to his lowly position, his opinions held little weight in the grand scheme of things. As a verb, weight functions transitively. It refers to making something heavier, and to making one feel concerned or burdened. Since it was their first time backpacking, they were unnecessarily weighted down by a bunch of non-essential items they didn’t even use. It is easy to tell that he is weighted with guilt from the incident. By weight: based on weight rather than volume or some other measurement. Be worth your/its weight in gold: extremely useful or helpful or valuable. Carry (one’s) weight/pull one’s weight: to do one’s part; fulfill one’s duties/responsibilities fairly. Carry a lot of weight with someone: be influential or respected by someone. Carry the weight of the world: to feel or act as if one has an immense amount of problems. Give weight to: to lend or attach importance or authority to something. According to Merriam-Webster’s, the word weight first appeared before the 12th century. This word comes from Middle English wight, weght from the Old English word wiht, which is related to Old Norse vaett, meaning weight, and Old English wegan, meaning to weigh. Where it refers to the importance of someone or something, the following words can be substituted for weight. When it is used to refer to one’s pull, influence or power, the following synonyms can replace weight. The word weight can function as a noun and a transitive verb.